Film & TV Tax Incentive Success! On June 27, 2018, Gov. 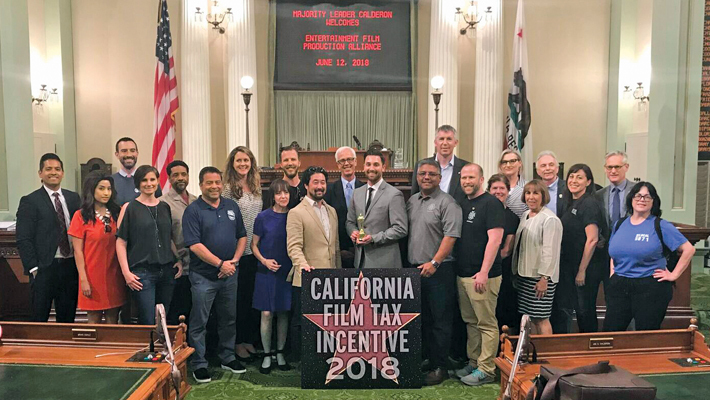 Jerry Brown signed into law, legislation that extends the current California Film and Television Tax Credit Program 2.0 through 2025. 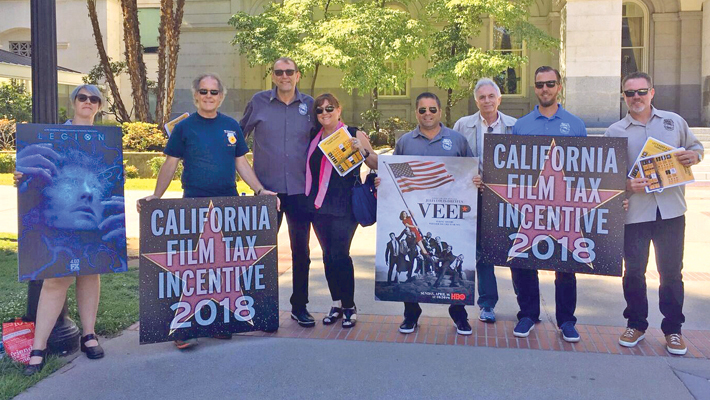 In 2014, the California IATSE Council (CIC), joined by the other guilds and unions, successfully fought for two years to get a bill passed to create this incentive program. We knew our members were hurting and we would not let up fighting until film and television production came back home to California. At the time, we told the California legislature that if they passed the incentive bill, production would return. And we were right. But we probably don’t need to tell you that. More than 45,000 cast and crew have been re-employed or employed on the 150 film and television productions that got the incentive. That’s $2.3 billion in wages paid to you and to other below-the-line men and women. And we have also brought back $5.9 billion to the state economy. While the current program does not expire until 2020, we all know that producers make production decisions a year or more in advance. We did not want to wait until the last minute to go for a renewal. We knew it was important to act now so that work would be here past 2020. Starting last year, the CIC began its work to pass new legislation to extend the current program. And we are thrilled to announce that we have succeeded. Legislators thought our bill was so important, they attached it to the state’s 2018 budget. We owe thanks to the two members of the legislature who carried our water: Assembly Majority Leader Ian Calderon and Sen. Holly Mitchell. It was their bills and their guidance that resulted in this success; to the Senate and Assembly Leadership who made the final decision to put us in the budget—Senate President Pro Tempore Toni Atkins and Assembly Speaker Anthony Rendon; and to Gov. Brown who signed it into law. The CIC was not alone in this fight and we recognize the efforts of our sisters and brothers in DGA, Teamsters, Laborers and SAG-AFTRA who worked side by side with us. Most of all, we owe thanks to you—especially the many members who turned out to have their photos taken or signed “thank you” cards to the elected representatives in Sacramento. Our effort to pass this extension may be concluded but our work is just beginning. And we know you’ll be there with us as we work to create a strong, vibrant and diverse film and television workforce throughout our Golden State. As we said throughout this campaign, Keep Filming in California! This is a time for us to celebrate the amazing accomplishment of getting the California Production Tax Incentive passed for five years. 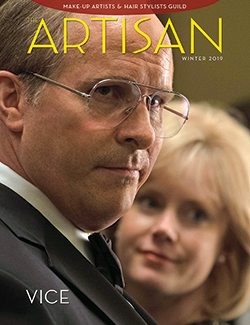 Without all of our IATSE leaders’ and members’ hard work and those of our leaders in all of the other unions and the Film and TV Alliance across the board, this would not have happened. I appreciate the opportunity that our Local 706 President Sue Cabral-Ebert recently gave to me to travel to Sacramento to thank the legislators who voted for the bill to pass. 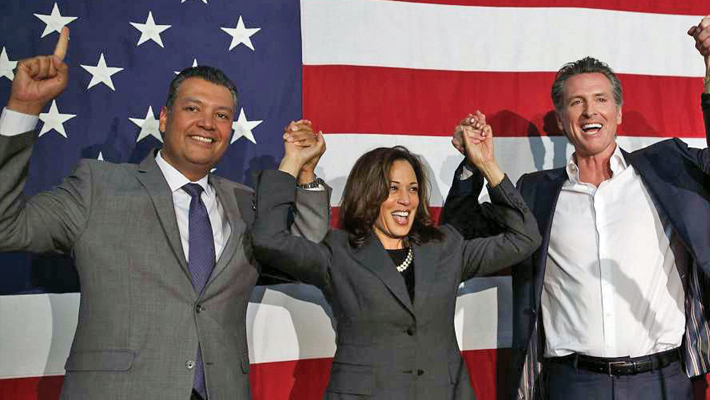 This voting and thank-you campaign has been worked at tirelessly by our union and unions all across California. Our mission was to thank those who voted for the bill and to encourage them to vote to put the money from the bill into the budget. For those who have not been informed yet, the budget puts forth $330 million each year for five years and all of the money is slated for below the line. This extends the credits with the bill now until 2025. Think about it realistically, this is all money allocated to the working film and television crews and their support systems in California. This keeps jobs in California, this keeps money in California and makes money for California, all the while keeping families together in California. This is unprecedented in the world we live in to have almost unanimous bipartisan support behind the tax incentives. To be standing with all our other IATSE brothers and sisters, such as the wardrobe, grip and camera locals, along with a huge coalition of the Teamsters, the independent filmmakers and film commissions from NorCal, Central California, SoCal and San Diego, all in unison fighting for the same goal, all together thanking our legislators. This has been an ongoing campaign for many years and our own Local 706 was on the ground level way back to when we passed the last California tax incentive. The facts and figures speak for themselves. This tax incentive which has helped us all to stay employed is actually a positive for the state of California. The more we film in California, the more money California makes. To date, more than 45,000 cast and crew have been re-employed or employed on the 150 film and TV productions that got the incentive. That’s $2.3 billion in wages paid to you and to other below-the-line men and women. And we have also brought back $5.9 billion to the state economy. I remember traveling to Sacramento when we were fighting to get the first Tax Incentive Bill passed and going into all of the legislators’ offices on both the Assembly and Senate side. The attitude and the support was very different back then. Now our legislators stand behind us and the bill. This was an opportunity for us to say thank you and let every single representative who voted yes on the tax incentive know how much they are appreciated. This visit to the Capitol let them see the actual working men and women who are affected by this incentive. It was a very eye-opening experience to see all the other lobbying and advocacy groups gathered to get attention to their cause, people clamoring and yelling and putting forth their grievances. This happens at the Capitol every single day, but our group received one-on-one attention from many of our Assembly and Senate men and women because our voices were positive and uplifting and we heard over and over from them on numerous occasions the words, “No one ever thanks us … We are with you!” Some of them went on to tell us they have relatives in the film and television industry, while sharing their personal stories and claiming they understood how special and important this vote was. Assemblyman Ian Calderon met with us and spoke about the importance of getting the tax incentive money into the budget and on the governor’s desk. He and fellow lawmakers (including Sen. Holly Mitchell) have worked continuously to galvanize support to make sure that the bill be included in the budget and that all the lawmakers that supported the bill would then vote for its inclusion. Brothers and sisters, it was included in the budget vote, passed and was recently signed by Gov. Jerry Brown! It’s such a small and easy thing to tell someone thank you, yet it makes such a big impression and such a huge difference. Think about how it feels when your department head or the actors, directors, producers you are working with, tell you thank you for your work and recognize you. That is what we were able to do in Sacramento. We acknowledged their yes vote, said thank you and asked them to get it in the budget—which they did! 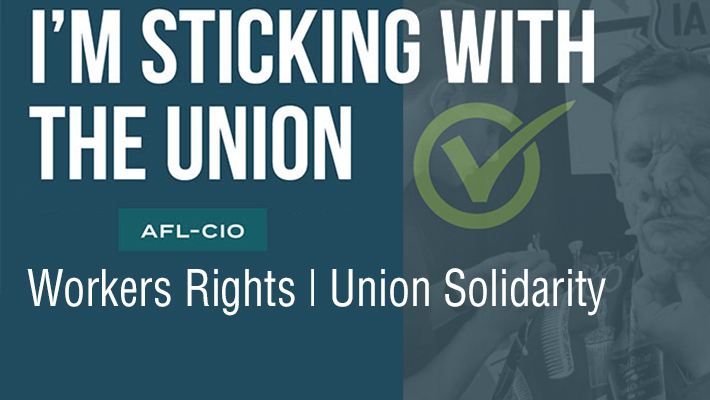 I urge each of you to continue to personally thank our legislators in California for their votes and all the 706 union leaders and members who took time to help fight for the passage of this bill. We should all be very happy and proud of the outcome. Congratulations to all and THANK YOU! The Supreme Court just ruled against working people in Janus v. AFSCME, Council 31, and in doing so, joined the dark web of corporate interests to continue the assault on all of us. This decision abandons decades of common sense precedent in favor of greater rights for corporations. In May, I attended an invitation-only rally at Local 80 for Lt. Gov. Gavin Newsom (candidate for governor) and Secretary of State Alex Padilla, kicking off their statewide bus campaign, “Courage. 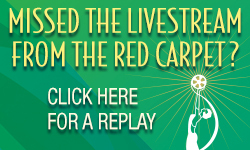 For A Change.” The keynote speaker was U.S. Sen. Kamala Harris! The event was attended by several hundred union members, including our international vice presidents Thom Davis and Michael Miller. Our Coalition of Resort Labor Union’s ‘Town Hall Rally for Disneyland Workers’ on June 2 at the River Arena in Anaheim was a HUGE HIT! U.S. Sen. Bernie Sanders spoke at the event and brought the house down! Local 706 president Sue Cabral-Ebert and IA Representative Peter Marley and Executive Board member Kato DeStefan attended the event, Theme Park members Jennifer ‘Jeg’ Green, Therese Levasseur and Megan McPherson provided hair & make-up expertise in the Green Room, Rebekah Pederson and Deserea Parrish were our Local’s spokespersons, and several of our Local 706 members were in the audience of 1,600 or more. Well over 200 news agencies covered the rally, and the event was streamed live on Facebook; it was a HUGE SUCCESS! Over 22,000 signed petitions were delivered to Anaheim City Hall in May, and the ‘Anaheim Resort Living Wage’ measure has now qualified for the November ballot! Sponsored by the labor unions within our Coalition, we are doing everything we can to educate the voters in Anaheim about this important ballot proposition. I have attended several rallies, forums and protests, and it feels as though the people of Anaheim are solidly behind us on this one! 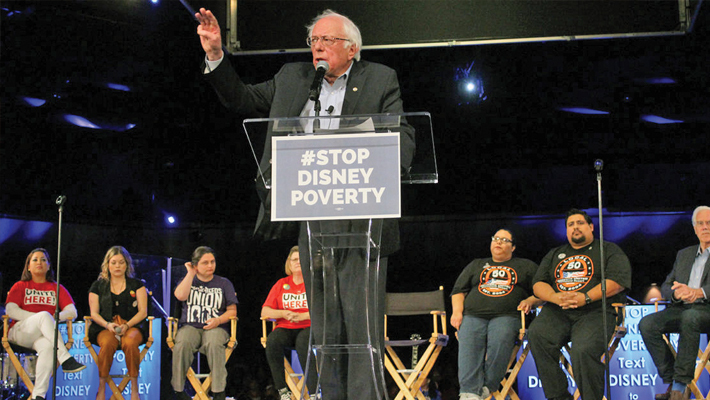 Editor’s note: As of press time, Disneyland Resort and four of the unions representing theme park workers announced they had reached a tentative contract agreement. Terms were not disclosed. In June, I attended a rally on the steps of L.A. City Hall to protest the ‘Janus decision’ by the U.S. Supreme Court, a very anti-labor ruling that will harm working Americans for a generation, and give corporations and other employers exactly what they want: limiting the effectiveness of unions. The rally was amazing, and reminded me that our SCOTUS has been on the ‘wrong side of history’ before: the Dred Scott decision, segregation, ‘separate but equal,’ internment of Japanese-Americans and interracial marriage. It will take a long time to overturn this horrible decision, but in the meantime, unions will have the opportunity to work harder and become stronger. This same month, Supreme Court Justice Kennedy announced his retirement. Justice Kennedy was not a particular friend of organized labor, but he was someone who believed that the Court should move slowly and cautiously. There is a very strong likelihood that the current administration will appoint an even more actively anti-labor justice in his place. Reminding us that elections have consequences. SB 999: Local 706 OPPOSED and WE CRUSHED IT! 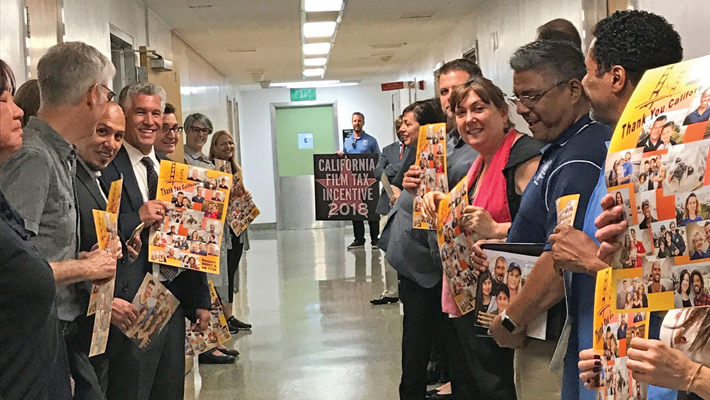 Members of Local 706 realized the problems this bill would create, enlisted the help of their president, who joined forces with the California State Board of Cosmetology, the Professional Beauty Association and the California Labor Federation. All those years of learning legislative processes and alliances would now come into play. 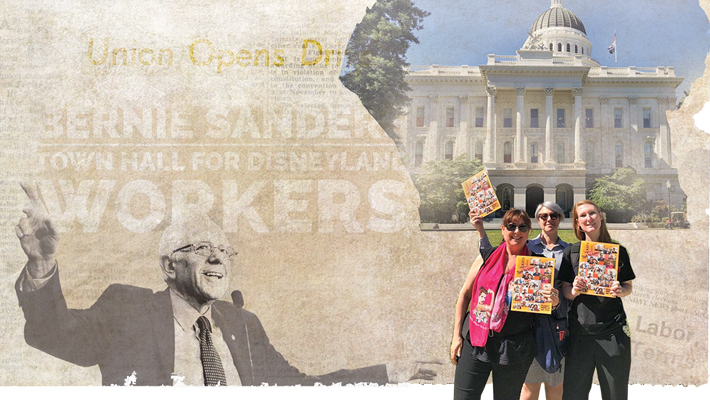 There were so many flaws in the “research” that Sen. Morrell and the lobbying group claimed to have done, it became very evident that this bill would seriously affect our film, television and Disneyland Collective Bargaining Agreements. Everything moved very quickly. SB 999 had already been sent to the senate for approval and had passed. This meant the next stop would be the California Assembly Business and Professions Committee. We became determined to stop this bill in committee, to crush it. 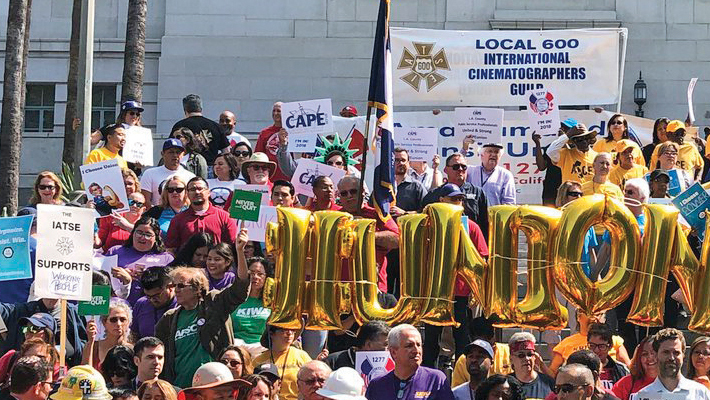 Assembly member Richard Bloom (D-Malibu, Santa Monica, Hollywood) was immediately contacted to alert him that Local 706 would be in opposition to this bill. Co-author Ben Allen (D-South Bay, Westside, Hollywood) was also alerted that Local 706 would be in opposition. Assemblyman Bloom’s staff stated they had received more than 900 phone calls and emails asking for him to vote “no” on the bill. I was asked to testify before the committee, one of two who were allowed to speak in opposition to the bill. 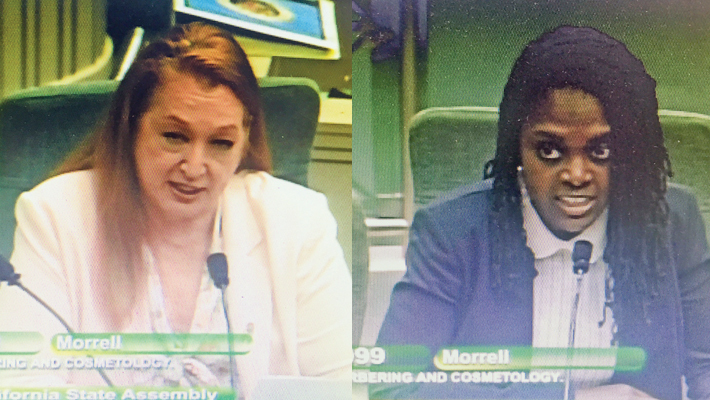 Dr. Kari Williams, president of the California Board of Cosmetology, and I flew to Sacramento to give our testimony. Sen. Morrell gave his proposal to deregulate the cosmetology license, stating how unnecessary it was and devaluing the educational aspect, as well as devaluing the skills of hair stylists. It was infuriating. He went on to falsely state that education was expensive and was a barrier to ethnic groups being able to afford it. Somehow, he forgot to mention that more than 30 community colleges and trade schools throughout California offer the cosmetology license very affordably. He completely ignored the health and safety aspects. Basically, it was his opinion that anybody should just be able to start shampooing, styling, curling, dressing and waving hair with no training whatsoever. The California Labor Federation opposed this concept on the basis that lowering the standards would lead to lowering wages in the profession. We want to maintain the standards, not lower them. I asked if they would prefer an unlicensed, uneducated person to deal with lice, impetigo or allergic reactions? Dr. Kari and I were each given one minute before the microphone. Then Sen. Morrell and his team had time to rebut, then take questions from the committee. After that, the Professional Beauty Association and the Cal Labor Fed, plus more than 100 hair stylists, salon owners, school owners and students from all over California came before the mic to voice their opposition. Dr. Kari and I were a bit nervous as most of the questions from the committee were seemingly pro-deregulation. Even though we had information that seemed to lead us to believe we would prevail, you never know. Then came the vote … we were victorious! (Three YES, 14 NO, two weren’t around for the vote.) The halls outside the committee hearing room erupted in joyous celebration. We did it! We stopped SB 999 in committee. It is done for now, but in the next year, the California Cosmetology Board will be reviewed.